Our stunning high-peak white 20’ Wide Pole Tents are as beautiful as they are functional! A tent is not a tent; with our tents, you will see the difference! 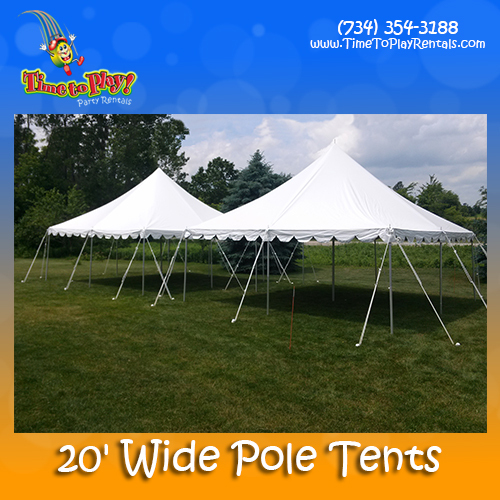 Our elegant white pole tents feature sturdy tops, scalloped valances and aluminum poles - ensuring that the elements stay outside your event. Add solid or French-window sidewalls, for privacy and protection from weather, as well as tent heaters for additional warmth. Our Pole Tents are most suitable for grass set-up; they cannot be installed on cement. The table below provides seating allowances for our Pole Tents. Allow additional space for buffet, cocktail, dessert, gift and other specialty tables.